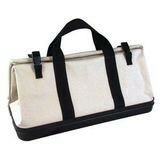 24" X 10" X 14" CANVAS GEAR BAG WITH MOLDED RUBBER BOTTOM | Tallman Equipment Co., Inc.
1 inside pocket. Many other sizes, styles and pocket combinations are available. Call Tallman Equipment for more information.